At one time during Buddha’s life, 500 monks who were staying with the Buddha were quarrelling all the time. The Buddha requested that they stopped quarreling but they did not heed his request. As such, the Buddha went alone deep into the forest (not reachable by human) to spent his vassa (rains retreat). Because of the Buddha’s parami (past cultivation), a monkey and an elephant came to offer food to him. The monkey went and collected fruits while the elephant collected honey to offer to the Buddha (elephants are not afraid of bee sting). At the end of the vassa (rains retreat), it was time for the Buddha to leave the forest. The monkey and the elephant were so sad. They pleaded with the Buddha not to leave and stay with them. 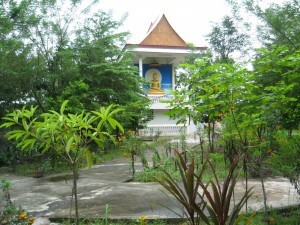 The Buddha told that that he still had to teach Dhamma to other beings. Unfortunately, since they were animals, they could not come along with Buddha to everywhere he went. They told Buddha that if Buddha left them, their hearts would break and they would die. The Buddha knew that by the power of their merits and offerings they had done, these animals would be reborn in the deva realm. Eventually, the Buddha left and these animals died and were really reborn as devas. As devas, they were able to follow Buddha wherever Buddha went. The moral of this story is to show us PATIENCE. Buddha had patience (khanti) as he travelled and was not afraid to stay alone in the forest. The Buddha had no fear even if he was so deep into the forest out of human habitation that he had nothing to eat. This story teaches us similarly that we need to be patient when faced with hostile situations. In some temples, you would see the seated Buddha, with an elephant and a monkey bringing offerings to him (example is Wat Palelai in Suphan Buri, Thailand and Singapore). As we recall this story and the virtue of the Buddha, we pray to him to teach and guide our hearts to have patience.